Premium Quality C4902AN Black Inkjet Cartridge compatible with the HP OfficeJet Pro 8000, OfficeJet Pro 8500. The use of compatible supplies does not void your printer warranty. Premium Quality C4906AN - C4909AN Black, Cyan, Magenta, Yellow Inkjet Cartridge (Value Bundle, 4 pk) compatible with the HP OfficeJet Pro 8000, OfficeJet Pro 8500. The use of compatible supplies does not void your printer warranty. 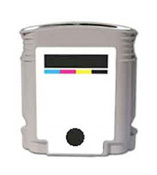 Premium Quality C4906AN Black Inkjet Cartridge compatible with the HP OfficeJet Pro 8000, OfficeJet Pro 8500. The use of compatible supplies does not void your printer warranty. Premium Quality C4906AN High Capacity Black Inkjet Cartridge (Version 2: Able to Read Ink Level) compatible with the HP OfficeJet Pro 8000, OfficeJet Pro 8500. The use of compatible supplies does not void your printer warranty. Premium Quality C4907AN Cyan Inkjet Cartridge compatible with the HP OfficeJet Pro 8000, OfficeJet Pro 8000 Wireless, OfficeJet Pro 8500. The use of compatible supplies does not void your printer warranty. Premium Quality C4907AN High Capacity Cyan Inkjet Cartridge (Version 2: Able to Read Ink Level) compatible with the HP OfficeJet Pro 8000, OfficeJet Pro 8000 Wireless, OfficeJet Pro 8500. The use of compatible supplies does not void your printer warranty.